Tashi Phuntshok situated around 3 km from the Paro International Airport. We, at Tashi Phuntshok have blend together the comforts of modern amenities with the sincerity of a real village life style to provide our guest the best of both worlds. 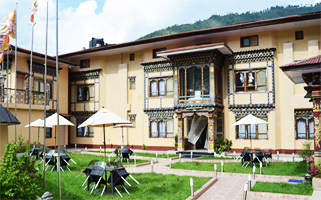 Set ad mists paddy fields and traditional rural houses; we strive to provide you with a truly marvelous experience of getting a first hand feel of the traditional customs and rural life in Bhutan while enjoying the luxury of our services. 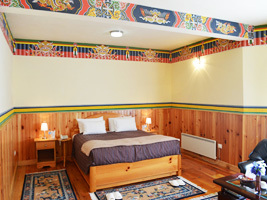 Tashi Phuntshok features 33 well-decorated rooms in which 2 are deluxe rooms, 27 are double deluxe rooms, 2 are single deluxe rooms and 02 are single standard rooms. All rooms are attached with spacious bath, running hot & cold water, direct STD / ISD. 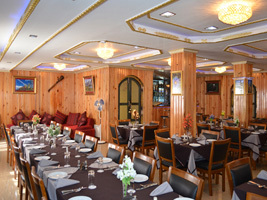 Hotel also provides a conference room with 40 seating capacity to meet all your meeting requirements. Our steam and sauna room are also available for you to unwind and relax after a busy day of sightseeing or hiking. Hotel facilities: Spa including massage and beauty care, gift shop, Laundry, Conference . Bar: Bar offers interesting collection of international as well as local beverages.